Ethereal photographs, which now adorn the 45-metre billboard on Kelvin Grove Road, document a journey to China and back for an Australian-born Chinese visual artist. Sydney-based Mimi Tong visited her parents' homeland for the first time as an adult in 2007 and found herself alone in a country where she couldn't speak the language and didn't fit in. In China, Ms Tong photographed scenes devoid of people as she strove to find her place in the populated country, and back in Sydney, displayed those photographs printed on sheer cloth. The gallery installation she photographed again, which resulted in elegant images of Chinese exteriors transparently layered over an Australian gallery interior. Those images, entitled Unfolding Ground, are now pasted on the Queensland University of Technology Kelvin Grove billboard. 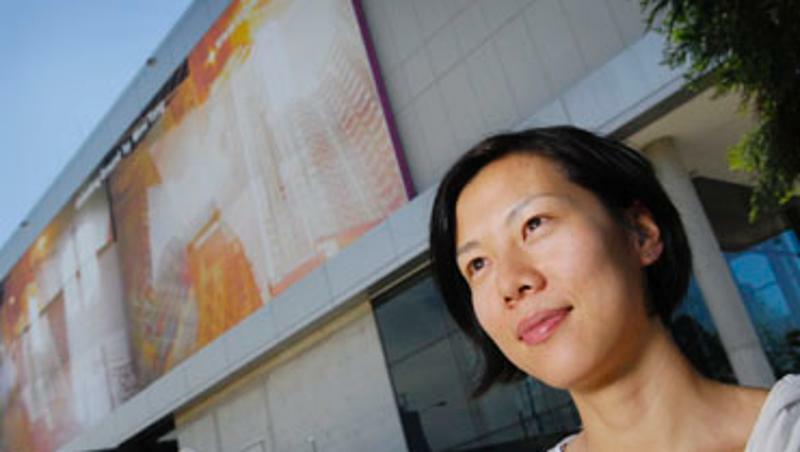 "In China, I looked like I blended in, but I actually felt alienated," Ms Tong said. "It challenged my own sense of identity, and I embraced that." Ms Tong said her photographs of empty Chinese landscapes resonated with her. "China is a very populated place," she said. "Walking through lots of places in China every day, I got bombarded with everything around me. The consumerism and consumption was overwhelming, but I was interested in urban landscape and I sought out quieter places. "Travelling alone, I was trying to find a mirror to my own travel experience and was searching for something of China that represented my own self." Unfolding Ground will be on the Kelvin Grove Road billboard until late February, 2009.